We predicted some seven years ago that Nepal was in a threshold of documentary revolution. Everything was in place: technology was more affordable and user-friendly, Nepali media was free, three (sometimes more) international film festivals took place in Kathmandu every year, and there was no dearth of ideas or enthusiasm. 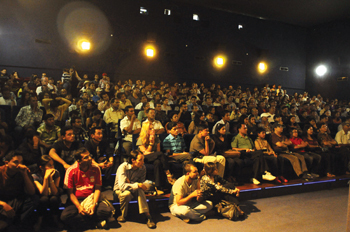 Nepalis are the perfect audience - we are young, excited, and we love documentaries. We watch documentaries in the same movie theatre where we watch Bollywood flicks. We believe documentaries must not be screened for free - we queue up, buy tickets, and show up on time. At film festivals, we watch films critically, reject mediocrity, and demand quality work. This will be evident next weekend at Kumari Cinemas where films at the 9th edition of Film Southasia will be screened from 3-6 October. Our love affair with documentaries started with the in 1994. The festival morphed very quickly because Nepal is more than just the Himalaya. As the festival evolved into Film Southasia, a generation grew up watching quality films from all over the region and the world. Over the years, this audience has seen films about the mountains, we have watched films about climbing, travel diaries, development films, and films with social messages. In Nepal, documentaries have changed the way we think about events. Dhruba Basnet's 2001 film The Killing Terraces brought the images of war to Kathmandu. Until then, the ‘People’s War’ was a far-away thing that happened to those who lived outside Kathmandu. A number of more war films followed after Basnet’s film. And the audience just could not get enough of them - they were shown in film festivals, the films travelled to different places in Nepal and Southasia, students organised public screenings, and charity events around them. Just like we moved away from ‘Himalyan’ films in the late 1990s, it was time to move away from war films. Nepal was changing, war was no longer in the hinterlands. The uprising had moved to Kathmandu. Everyday, still photographers were putting out beautiful, heartbreaking images of the people’s struggle during such a historical event. With technology being more accessible than ever, we naturally assumed that filmmakers and enthusiasts were going out there and doing the same. Unfortunately, only some footage from the 2006 April Uprising turned into a handful of forgettable documentaries. Majority of footage still remains forgotten in the hard-drives all over Nepal. After 2006, Nepal changed rapidly - Madhes rose in an uprising, Constituent Assembly elections took place, we ended the 240-year-old monarchy. Yet, documentaries that looked at these events critically were not produced. And this slump was not just in political documentaries. Nepali filmmakers’ examination of social and cultural issues also suffered. Non-Nepali one-film-one-project filmmakers replaced veteran Nepali filmmakers. Although there are some excellent filmmakers who still consistently produce documentaries in Nepal despite all odds, their numbers are small. Young filmmakers don’t have role models to look up to. With veteran filmmakers gone and no new-crowd coming in, the predicted Nepali documentary revolution lost steam. Documentary making is a long, arduous, and an extremely lonely process. Filmmakers have to be wedded to the subject - you live, breath, eat, and feel the stories enough to sacrifice months of your lives to sit behind camera and editing screen. Funding for documentaries is a challenge but there are resources out there to help filmmakers - foundations, awards, and crowd funding. The much bigger challenge in the world of documentaries is good storytelling. Technology has made it easier for us to produce and edit films but technology doesn’t make good documentaries, good storytellers do. We are a country full of good stories and a city full of audience that looks forward to film festivals and waits patiently for Nepali films. We have colleges full of young media studies students with novel ideas, amazing sensitivity towards issues, and inexhaustible excitement. They aspire to be good documentary filmmakers and are hungry to learn. Storytellers can be trained, cinematic grammar can be taught, and good editors can be groomed. As we attend Film Southasia ’13 and watch the best works to come out of the region in the last two years, we must reflect on how far we have come as a documentary audience. As filmmakers, documentary film and broadcast producers, film festival organisers, television channel owners, journalists, film critics, and documentary enthusiasts we must understand there are ideas and excitement to be harnessed within this young Nepali crowd. We need our veteran filmmakers back producing, training this young crowd. We need them to share what they know so that we produce a generation of documentary filmmakers who produce quality work. Our audience wants good stories, the world wants to hear Nepali stories, and we want Nepali films to travel internationally to film festivals. Our work with the audience is done and we have established that no shortage of enthusiasm and ideas. Now our work needs to focus on finding good teachers to critique, encourage, and assist with these ideas so that we produce world-class documentaries that compete internationally.